FACTORY SPECIFICATION INCLUDES :- METALLIC PAINT, MANUAL TRANSMISSION, LEATHER ELECTRIC SPORTS SEATS WITH DRIVERS’ MEMORY, ALU CUBE BLACK INTERIOR TRIM, ELECTRIC FOLDING ROOF, REMOVABLE FACTORY HARDTOP IN BODY COLOUR, AUTOMATIC CLIMATE CONTROL. 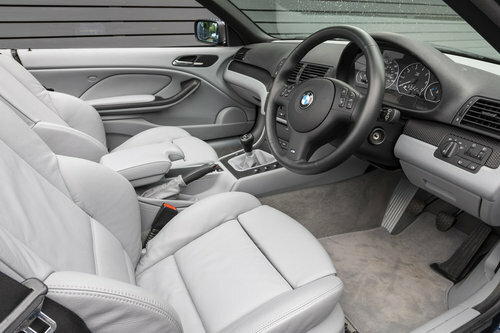 REMOTE CENTRAL LOCKING, ELECTRIC WINDOWS, WINDSCREEN WITH GREEN SHADE BAND, DYNAMIC STABILITY CONTROL, BMW M DOUBLE-SPOKE ALLOYS, HIGH GLOSS SHADOW LINE, MULTI-FUNCTION LEATHER STEERING WHEEL, FRONT CENTRE ARMREST, ON-BOARD COMPUTER, HEADLIGHT CLEANING SYSTEM, CONTRASTING DARK BLUE ELECTRIC HOOD, HARMON KARDON HI-FI SYSTEM, REAR PARK DISTANCE CONTROL, RAIN SENSOR. 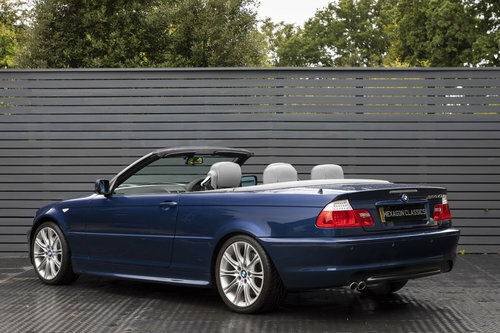 Hexagon Classics are delighted to offer possibly the lowest mileage BMW E46 Convertible currently on offer. 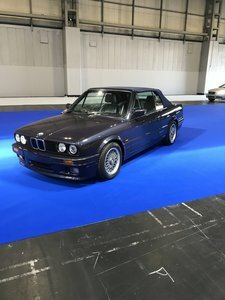 Specified in a highly desirable colour combination, this car has only covered 9,490 miles from new, and is in near factory-perfect condition throughout, having had just 2 private keepers. The manual 6-speed gearbox is a real bonus, ideal for touring and long trips. The removable factory hardtop is perfect to combat the UK climate, and provides the car with a coupé style when fitted. 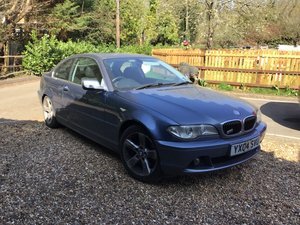 The E46 series is possibly the best-loved of the 3 Series’ many incarnations. 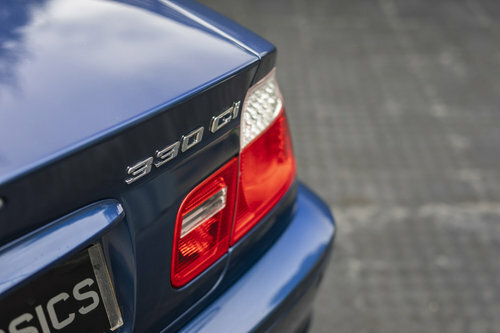 The 330 Ci with its M54 straight-six engine produced an impressive 228hp, and a huge 300Nm of torque. 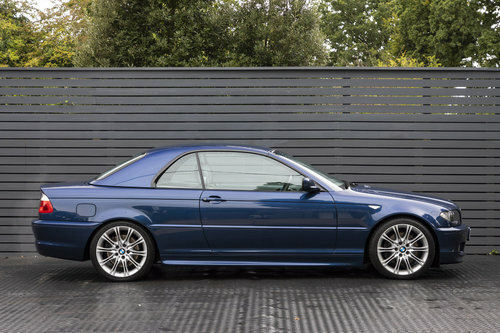 The E46 was the very first 3 Series to be available with an engine using variable valve lift system -Valvetronic. Aluminium was also used for an increased quantity of suspension components, in order to decrease unsprung mass. 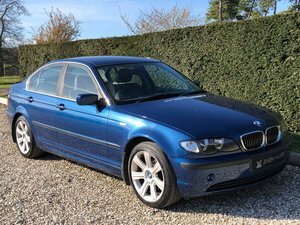 The MSport option with its larger alloys and sports suspension was better-suited to more spirited driving and was the best-looking of the 3 series variants. 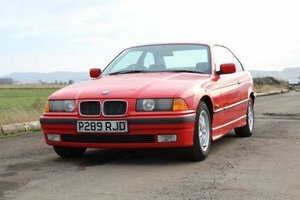 This BMW has been sparingly used, and to find a comparable anywhere would be difficult. 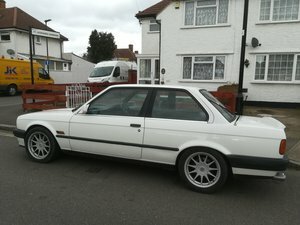 Originally supplied by Cooper BMW, Chigwell in June 2003, the car retains all its original keys, handbooks and tools. 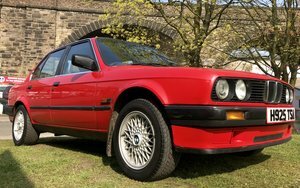 The history file also has all the annual MOT’s to verify its ultra-low mileage. The 330Ci has been fully prepared by Hexagon’s BMW-trained technicians and is all ready for the new owner to enjoy. 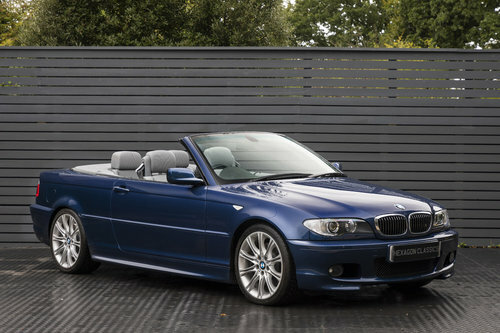 The 330 Ci Convertible will be supplied with a new MOT, and a 12-month RAC warranty.